Not sure what to make of this, interesting to see the prominence of ‘member states’, as they are certainly crucial in determining the success or failure of the strategy. Given the responses in the last few weeks (including France’s pushback at Ventimiglia), the latter seems a much more likely outcome. Assuming that the ‘kingdom’ in the cloud stands for the UK, it confirms that the UK is a major player on this agenda, despite having the right to opt-out from some components of it. Interesting also to see the difference between ‘migration’ and ‘migrants’, a sign perhaps that EU legislators are much more comfortable with the process than with human beings. 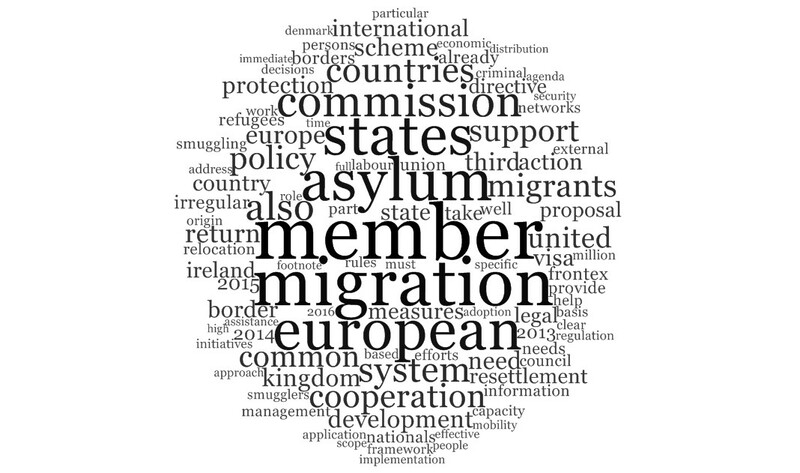 Not surprisingly, ‘smugglers’, ‘criminal network’and ‘smuggling’ also make the top 150 words, but not ‘traffickers’, term often used by the Italian PM to justify is interventionist agenda. Finally, the EU solutions are also there: ‘return’ (larger), ‘resettlement’, ‘relocation’, ‘distribution’ but also ‘border’ and ‘borders’.